Product Description This Automatic Medication Dispenser has a red indicator light that will flash when the alarm goes off. The MedReady with Flashing Light is helpful to anyone who is hearing impaired as well as Alzheimer's patients who respond to visual cues instead of audio ones. Did I take those morning pills? Double dosing on medication is a problem for people with memory issues or a complicated medication routine. This lockable medication dispenser will prevent medication errors like overdosing. It also serves as a reminder. Stores up to 28 days of medication if dispensed once a day or a week's worth if dispensed 4 times a day. 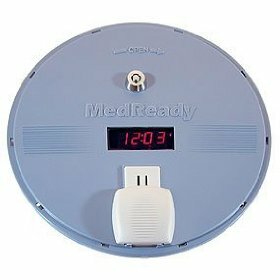 Set 1 to 4 daily alarms to match your medication regimen and let the MedReady do the rest. The pill dispenser alarms set easily, just like an alarm clock. The only way to turn the alarm off is to open the door to the medication compartment. The standard alarm rings continuously until the door is opened, but this alarm can be limited to 30, 45, 60 or 250 minutes. MedReady is tamper-resistant. 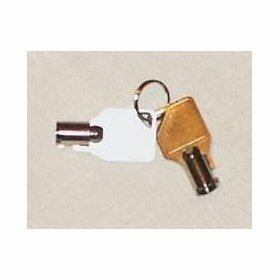 Instead of employing a latch, the system utilizes a real lock and key, and the edges are secure. This deters "fiddling" with the medications by people with Alzheimer's or other memory issues. (Please Note: The MedReady is not the answer for restriction of addictive drugs. If an addicted person wants access to the drugs, they may be able to break into the MedReady.) 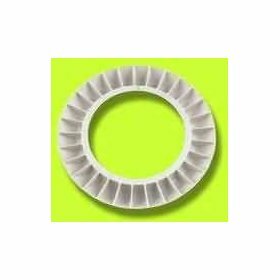 Dimensions: Overall Diameter: 11"; Pill Compartments: 1" x 0.5" x 0.75"